SWR below 1:1.1 > 350 Khz. Above the azimuth plot. 8,42 dBI gain. Above the freespace elevation plot. 3 meter long 22 mm tubes (center piece) inserted with 18mm (end tips). 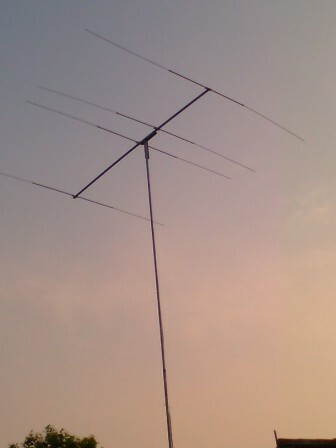 A home made 4el OWA using inches at : 91SD/OC075 (91SD750). Thank you for sending the picture Itji ! 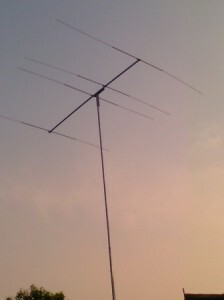 SWR 1:1.1 < 350 Khz. Above the azimuth plot. 8,34 dBI gain. 5/8 inch and 1/2 inch tubing. The 5/8 inch tubing is 3 meters long the 1/2 inch tubing are inserted on both ends to complete the element length.